New Victorian Defence Industry Advocate, John O’Callaghan – or Johnno as he’s widely known – is positioning our state to secure defence contracts. And the economic rewards promise to be significant. 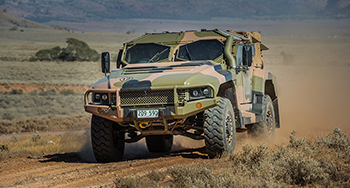 Over the next decade, the Australian Defence Force (ADF) plans to invest $200 billion to upgrade or replace around 85 per cent of its equipment. The opportunities available to Victorian industry extend across a range of defence needs including land, maritime, aerospace and digital/ICT platforms and services. Johnno’s plan is to help our local companies – especially SMEs – access defence supply chains both here and overseas, supplying goods and services to the ADF. This, he points out, will lead to more jobs for Victoria, and will help encourage young Victorians – notably engineers – to consider employment prospects in the sector. And Victoria is well-placed to create these opportunities. International companies such as BAE Systems Australia and Thales Australia have a growing presence here, connecting with Victorian companies and talented workers across the state, while providing access to new technologies and export opportunities. "My challenge," Johnno says, "is to ensure those companies are aware of the wide-ranging expertise in Victoria’s defence industry, including in rural and regional areas such as Bendigo and Geelong." While he’s the first to note that he has "big shoes to fill" given the first Victorian Defence Industry Advocate was former Federal Minister for Defence Personnel, Materiel and Science, Greg Combet, Johnno’s own career is pretty impressive and his previous roles have prepared him well for the task at hand. As past Executive Director of the Australian Industry Group’s Defence Council, which brings together CEOs of Australia’s major defence industry companies, Johnno’s familiar with the capability and strengths within Victoria. Working with Australia’s former Deputy Prime Minister Kim Beazley has also stood him in good career stead. "To this day, I receive his strategic guidance drawing on his knowledge as a former Minister for Defence and Australia’s former Ambassador in Washington DC. "For me," Johnno adds, "the most exciting thing in my new role is the opportunity to expand my knowledge of the advanced technology credentials of Victorian defence industry companies, especially in the maritime and military vehicle domains." He’s there to support Victoria’s defence businesses, listening to their ideas and concerns, providing advice to the government on how best to support the sector and, of course, taking every opportunity to advocate for their inclusion in domestic and global supply chains. Find out more about Victoria’s Defence industry.